I have written about fontself type making tool (and colour fonts) previously - but this particular post I have been meaning to share for sometime... As a typographer I primarily deal in the selection and arrangement of typefaces. I am not a type designer - but I do design custom type treatments, glyphs and lettering in my editorial and research work from time to time. Back in 2002 I taught myself fontographer and designed some naive and awkward fonts for use in my book design work. I really loved fontographer as a platform but I didnt have the talent or patience to develop a typeface (what you see) into a functional font (what you use). Over the last 15 years I have played a little with Fontographer, Glyphs, and Fontlab but very few of my type drawings were ever liberated from the 5mm grid of my sketch book and those that were, rarely saw any action beyond a bezier in illustrator! Last year I began working on a typeface - (again I want to stress here I am NOT and dont profess to be a type designer!) the typeface is an experiment in typographic transparency. In support of some research I am doing around textual meaning in book design. 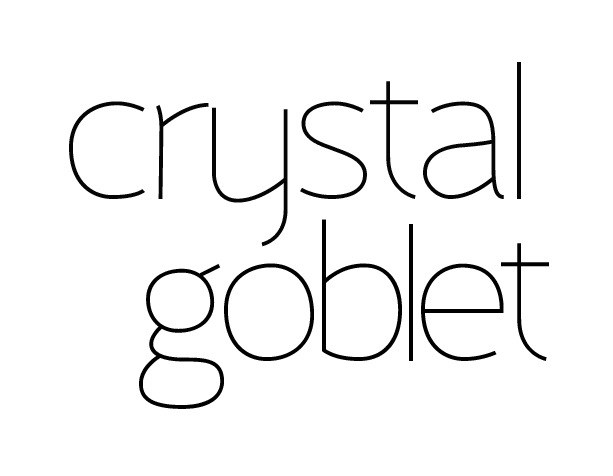 I believe we can never have meaning unmediated by form, so I wanted to create a typeface which played with Beatrice Wardes Crystal Goblet visual metaphor. Initially, I began in pencil and then translated my smudgy drawings into basic archetypal shape vectors in illustrator but quickly found designing something that suggested transparency in black and white to be bloody hard work! Fontself founder Franz Hoffman had been in touch a few times about previous posts I had written on his software and the potential of colour fonts and suggested I give it a go so I set about creating my font in two stages using the fontself tools. Once you have vectors the Fontself illustrator plug-in makes it simple to generate a .ttf (which I need to say here was an incredibly easy process - using fontself I was able to generate a font in about 10% of the time it would have taken me in any other software I have used). Quite literally, the most time-consuming thing is splitting your characters onto different layers - then you just drag and drop them into the plug-ins glyph map (which you can do as batches of a-z and A-Z or as individual characters etc). Now my black archetypal glyphs were a font I was able to typeset them in photoshop and try different colour combinations and transparency effects. Once I had a visual treatment I liked I was then able to use the fontself photoshop plug in to export the typeface as a colour font. Once again this was dead easy. The interface and user experience from installing the plug-ins to generating the font is well considered. Throughout the process, there are really handy user resources and pop-up tips and tricks while you're working. Just as with any font development program your grids and guides are important. I did have some of my descenders move up to the baseline - a rookie error where my guides were not selected when I dragged my artwork into the Fontself window, (so it intuitively aligned to the edge of the artwork which means some of my letters hover up and down on the baseline depending on how the opacity feathers out). This intuitive feature will be really helpful in some fonts but it wasnt what I intended here. Thankfully it is simple enough to correct with the built in vertical spacing features in the fontself plug-in. (you can adjust side bearings and horizontal space too). While its not a tool for professional type designers - if you are a graphic designer, typographer or calligrapher who creates type this is an incredibly easy to use (and great value) tool I would highly recommend. Anyone who can use photoshop or illustrator can make a fully functional font with fontself. My clumsy play doesn't do the software justice in demonstrating how revolutionary a tool this is and what amazing things can be created with it. A recent (fantastic) example is Type with Pride. On 31 March, 2017, Gilbert Baker the creator of the iconic Rainbow Flag sadly passed away. Mr. Baker was both an LGBTQ activist and artist, and was known for helping friends create banners for protests and marches. To honor the memory of Gilbert Baker, NewFest and NYC Pride partnered with Fontself to create a free font inspired by the design language of the iconic Rainbow Flag, the font was named 'Gilbert' after Mr. Baker.